Box Text: So you think the life of a Marvel Super Hero is an easy one? Wrong! Take Spider-Man for example. While he's out protecting decent folk, a group of evil mutants kidnap his wife and threaten to "neutralize" her if their demands aren't met. Now Spidey's got to get her back before something terrible happens. It won't be easy though, because he's got the likes of Hobgoblin, Mysterio, Dr. Octopus, and some of Marvel's other favorite "baddies" standing in his way. 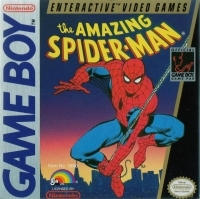 So, if you feel up to the challenge and you're ready for some serious wall-crawling, make sure your web spinners are full and batteries fresh before you tackle this Game Boy adventure. We're sure you'll be playing this one for a long, long time. 07-17-2017 pzeke Box Text So you think the life of a Marvel Super Hero is an easy one? Wrong! Take Spider-Man for example. While he's out protecting decent folk, a group of evil mutants kidnap his wife and threaten to "neutralize" her if their demands aren't met. Now Spidey's got to get her back before something terrible happens. It won't be easy though, because he's got the likes of Hobgoblin, Mysterio, Dr. Octopus, and some of Marvel's other favorite "baddies" standing in his way. 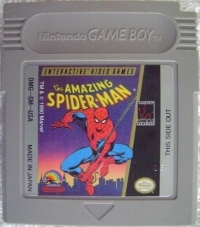 So, if you feel up to the challenge and you're ready for some serious wall-crawling, make sure your web spinners are full and batteries fresh before you tackle this Game Boy adventure. We're sure you'll be playing this one for a long, long time. 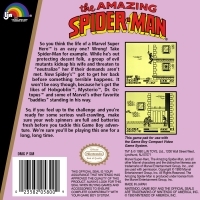 This is a list of VGCollect users who have Amazing Spider-Man, The in their Collection. This is a list of VGCollect users who have Amazing Spider-Man, The in their Sell List. This is a list of VGCollect users who have Amazing Spider-Man, The in their Wish List.